I didn't do all that well with my needlework this week. I did sort out some of the fabrics and patterns for the Bird quilt with the best of intentions yesterday, but then I picked up 'Brother Odd' by Dean Koontz and didn't stop till I was finished. oops, so much for sewing. That book review should follow in a few days. I did better on my knitting. 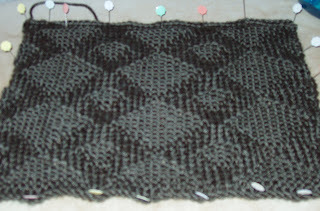 I finished all the blocks from the second 'clue' on the Bernat Knit Along, and two of the three for the third pattern. I really like these diamonds. So far the three patterns have only used knit and purl stitches. I plan to have more to show you next week. Be sure to visit Darilyn over at 'Tropical Screamer', she has joined me this week in a Needlework update. Thanks for coming by to visit.